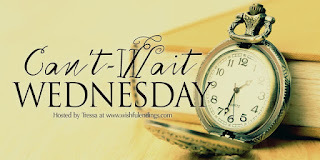 These two upcoming releases caught my eye this week: a historical cozy mystery (because I wish I was on holiday still) and a historical novel by an author I trust (not to mention the book sounds like it will be good!). Heading off for a long-overdue holiday to Whitby, she visits her school friend Alma who works as a fortune teller there. Kate had been looking forward to a relaxing seaside sojourn, but upon arrival discovers that Alma's daughter Felicity has disappeared, leaving her mother a note and the pawn ticket for their only asset: a watch-guard. A powerful novel about an orphan boy who is raffled off at Seattle’s 1909 World Fair, and the friends who teach him what it really means to have a family, from the author of Hotel on the Corner of Bitter and Sweet. Do these sound like something you would like to read too? I plan to read Love and Other Consolation Prizes at some point. I heard it's really good. Christy - I am excited about Ford's book. It does sound good! Thanks for visiting! Both books sound good. I can't wait to read Love and Other Consolation Prizes too! I am eager to read both of these, but especially Ford's book! These both sound like compelling reads. I would have loved to read that cozy historical novel while I was on vacation last week. And OMG, raffling off an orphan at the fair? I teared up at just the idea of that because it sounded so awful, but then immediately felt much better about it when I started reading the part about friendship and family. So yes, I'd definitely consider reading both of these, lol. Suzanne - I was thinking the same thing! 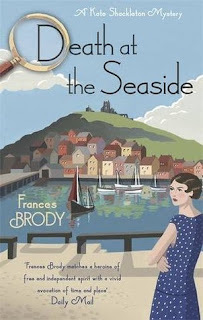 Death At the Seaside would make a great vacation read. I loved Ford's The Hotel On the Corner of Bitter and Sweet and am excited to read his upcoming book! Thanks for stopping by, Suzanne! Both sounds good, Wendy! 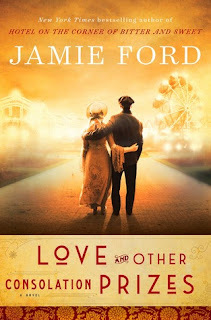 I'm curious about Jamie Ford's latest since I enjoyed his first novel so much. Melody - I am eager to dive into that one as well. Thanks for visiting! Love and Other Consolation Prizes sounds amazing and ... bittersweet comes to mind. Great picks! Verushka - I am really looking forward to that one! Thank you. I can't wait to read Love and Other Consolation Prizes! Kathy - Me either! It sounds so good! Lillian - I hope we both enjoy it too! These sound good, but I really like the sounds of Love and Other Consolation Prizes. Great picks. I've seen quite a few people who read and enjoy that mystery series so I bet it will be good. Nice choices this week! Barb - That is good news! I haven't read anything by Brody before so this will be my first. Thanks for stopping by! I have a copy of Love and Other Consolation Prizes, I am eager to check it out. The other is new to me, but it sounds fun. Heidi - It sounds good doesn't it? I hope we both enjoy it! Thanks for visiting! Lark - Thank you! I am especially excited about that one as well. Thanks for stopping by! Oooh! Both sound like cute reads! Great picks! Thanks for checking out my WoW! I might have to read Jamie Ford's new book. It has been a long time since I read his work. I hope you love both of these! Carole - I am really looking forward to Ford's book. I still haven't read his second one so that's on my list to read too. Thanks for stopping by! I am a huge fan of Jamie Ford. I will be definitely getting a hold of that one. I loved Hotel on the Corner of Bitter and Sweet. Thanks for visiting! Love the cover of Death at the Seaside, but the Ford book interests me more! Jenclair - I like both covers quite a bit, but I have to agree. I'm most excited about Ford's book. Although I am looking forward to the other one as well. Death at the Seaside is on my TBR. Love the cover and the premise. Definitely looks like my kind of book! Not as sure about the Jamie Ford though I'll be keeping an eye out for reviews. Katherine - I hope we both enjoy Death at the Seaside. It sounds like it will be good! Internet service (as well as phone service) has been spotty on my cell, but, thankfully, I have access to the Net on my laptop! Now I'm trying to catch up with my comment replies, comments back, and blog posts. Your picks this (last) week are interesting, although I'm not so sure about the second book. The first one, though, really intrigues me, as I LOVE the 1920s setting, and even more so because it's in England, a country dear to my literary heart. Besides, I really need to read a cozy mystery at SOME point in my life, for goodness' sake, right? Lol. Maria - I am so glad you and your husband are safe and okay! I thought of you the entire time Irma was making it's way through Florida, wondering how you were doing. Thank you for checking in!